Wilbur Bestwick was born on 27 November 1911 in Sabetha, KS. He graduated from high school in Sabetha in 1932. He enlisted in the U.S. Marine Corps in 1934 and received his basic training at the Marine Corps Recruit Depot in San Diego, CA. Bestwick saw pre-World War II duty at sea aboard the USS Louisville, and served at Marine posts in Bremerton, WA, San Diego, and Camp Elliott, CA. 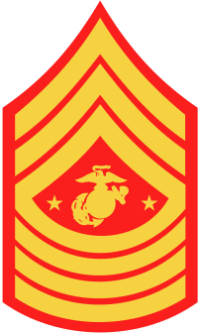 Promoted to Sergeant Major in 1943, he saw World War II combat while serving in this capacity with the 3rd Marine Division in the Bougainville and Guam campaigns. On his return to the U.S. in December 1944, Bestwick served as Sergeant Major of the Mare Island (California) Shipyard. He was transferred to San Francisco in 1945, and completed a four-year tour of duty there as Sergeant Major of the Marine Corps Depot of Supplies. In 1949, he became Sergeant Major of the Marine Corps Recruit Depot Parris Island. During the Korean War, he joined the 1st Marine Division in Korea in October 1952 as Division Sergeant Major, and after a year overseas returned to the U.S. 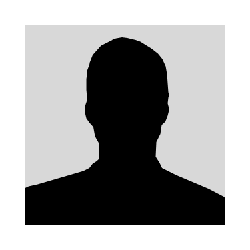 He began a two-year assignment in 1954 as Sergeant Major, Inspector and Instructor Staff, 1st Air Delivery Company, San Jose, CA. Transferred to Headquarters Marine Corps, Washington, DC, in June 1956, Sergeant Major Bestwick served as Sergeant Major to the Secretary of the General Staff until 23 May 1957, when he was the first to serve in the newly-established post of Sergeant Major of the Marine Corps. 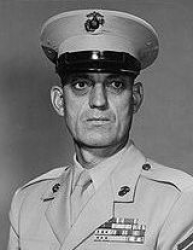 Bestwick served as the Sergeant Major of the Marine Corps until he retired from active duty on 1 September 1959. After retiring, Sergeant Major Bestwick lived in Santa Clara, CA, until his death. Sergeant Major Wilbur Bestwick died on 10 July 1972 at Stanford University Hospital. He is buried at Skylawn Memorial Park in San Mateo, CA.